From the first announcements back in 2013, it was clear this year’s Venice Architecture Biennale would be different. Starting with the change in season, then a change in the exhibition format and of course a new curator - the influential Dutch architect Rem Koolhaas - everything seemed to point to the fact that, in 2014, the biannual celebration of architecture would offer a unique take on the industry zeitgeist. And it does. Delving into his overall theme of Fundamentals in architecture, Koolhaas, supported by his OMA/AMO team, looked after the biennale’s two main events and set the pace for the national pavilions. Exploring issues of modernity in architecture, culture and society, this year’s shows are a feast of research and analysis, craft and materials, dipping into archives around the globe for a hefty volume of information. They make for a must-see whistlestop tour of the past, present and future of the practice. Pestellini looks at the show as a ’scan’ of Italy, from south to north, though it’s not necessarily meant to provide answers. ’For me, it is a point of departure,’ he says. Certainly the experience raises more questions as one progresses through the long, darkened halls of the Arsenale, beset by large-scale projections, collaborative dance, operatic performances and installations. The central pavilion at the Giardini, by contrast, provides a contemplative experience. For this second of his curated areas, entitled Elements of Architecture, Koolhaas goes back to basics. ’Architecture is a profession trained to put things together,’ he says, ’not take things apart.’ So this is exactly what he does. Dismantling the art of building into its parts, Koolhaas dedicates each room to an element - floor, balcony, facade, wall, escalator, toilet, door, corridor, elevator, ramp, window, ceiling, roof, fireplace and stair. The results - like the Brooking Collection of architectural features in the ’window’ room - are unusually exciting. 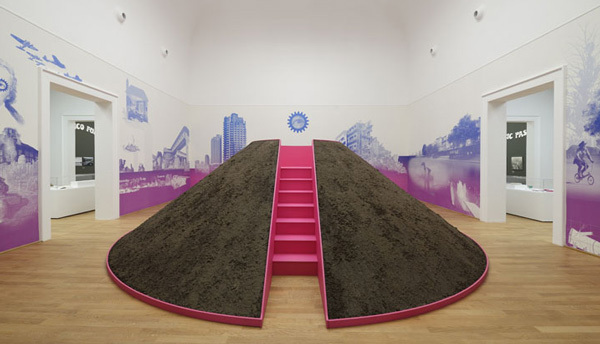 The global participants, spread across the Giardini and various locations in Venice, have responded to Koolhaas’ theme in different ways, though some common threads are detectable. Archival and historical research remain a strong premise, dominating, for instance, the British, Belgian, Dutch, Brazilian, Greek, Swiss and Australian pavilions (the latter featuring an augmented reality format as it is waiting for its new physical space to complete, by Denton Corker Marshall). The idea of looking back is, after all, part of the theme. This year stands out also for its inclusiveness, with 11 new participants, including New Zealand, Morocco and Turkey. Even Antarctica is represented, with a pavilion of experimental, built and unbuilt projects ’examining the provisional nature of architecture in Antarctica’. An absence of more established architects in the main exhibitions is more than made up for in the national pavilions and the sheer number of collateral events - official and unofficial - that have sprung up across town. The substantial Time Space Existence exhibition, spread across two Venetian palazzi and curated by the Global Art Affairs Foundation, includes an impressive 100 architects, including Foster and Partners, AHMM, Eduardo Souto de Moura and Ricardo Bofill. At the same time, the Fondazione Cini, on the island of San Giorgio Maggiore, does the opposite, focusing on one piece by a single artist: the Japanese photographer Hiroshi Sugimoto. Art has indeed crept into the architecture biennale in several places, blending ever more with design and the public realm. Genius Locci, a show by London’s Lisson Gallery, examines this with a selection of sculpture and installation art by the likes of Ai Weiwei and Daniel Buren. Ultimately, it is a biennale about history and information, with the sheer depth of research often threatening to overwhelm the casual visitor. Dozens of books are due to spin off the 2014 event, and some even speak of finding a permanent home for the fantastic displays in the central pavilion. If nothing else, Koolhaas’s key achievement has been to take the spotlight off the stars and shine it on the overlooked corners of a global profession. Charting 100 years of societal upheaval is a tall order, but Koolhaas and his collaborators have made the 2014 Venice Biennale an important waypoint on modern architecture’s ongoing journey.